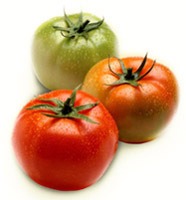 At M & R Tomato we are able to offer a full line of fresh, high quality produce. We specialize in gas green tomatoes, roma tomatoes, cherry and grape tomatoes. M & R handles vine-ripened and greenhouse tomatoes as well. Our tomato repacking department can provide you with the finest repacks for those customers who demand the best. In addition to our tomatoes, we proudly offer a variety of fresh fruit and vegetable, including potatoes and onions. Our products comes from the finest shippers and we carry premier labels so that we can provide you the best quality.